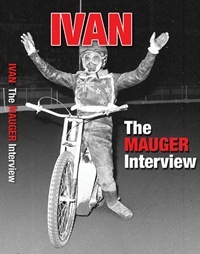 Six times World Champion, Speedway Star's Man of the Millennium and now the subject of a new DVD from Retro-Speedway, it's Ivan Mauger. Ivan is interviewed by Tony McDonald from Retro-Speedway, the interview (recorded in a pub) is audio only so a wonderful selection of archive photographs are used to illustrate the discussion. Despite the location of the recording, the sound quality isn't bad - the odd clink of a glass and some traffic noise don't prove too distracting. Ivan's career was multi-faceted so rather than tell the story chronologically, the DVD jumps between different sections of his career as particular subjects are discussed - sponsors, clubs, innovations etc. It's a pity that there aren't chapter markers on the DVD to allow you to jump straight to these sections. Much of Ivan's career coincided with the regular speedway coverage on ITV's World of Sport programme. As a result there's lots of great colour footage of Ivan to enjoy on this DVD. Big meetings at Wembley and elsewhere are on here - with Dave Lanning on commentary duties. The footage from the 70's also gives us another reminder of just how ragged starts could be in those days. Ivan believes the current starting regulations are a vast improvement and that they would have suited him better. This is a surprising view until he explains his logic, suggesting that many riders in league meetings would jump the tapes just to try and beat him, happy to risk the odd exclusion along the way. One thing that shines through is Ivan's love of team speedway. He's primarily remembered as a great individual rider, but his record as a captain is probably unsurpassed. He recalls his involvement in team planning at his various tracks and the success this led to for Belle Vue, Exeter and almost Hull. The Vikings famously blowing their chance to win the league when some riders failed to arrive at Wimbledon for a late season encounter. There's no doubt that Ivan still bears a grudge or two on the particular matter. His success on the world stage is unequalled - six individual world titles and many more in other competitions adds up to an enviable haul of silver. On the question of whether he was the greatest ever, Ivan has little doubt. He refuses to compare his record of six world titles with Tony Rickardsson's - simply saying that they were won in a different competition and therefore aren't comparable. The DVD includes video footage of his individual wins and a number of other title wins - including Longtrack. His role as an innovator is also a source of great pride to Ivan. Whether it was alloy handlebars, glitter guards or small seats, he led where others followed. Ivan is an interesting man and thinks deeply about all aspects of the sport. He reveals that he considered buying Belle Vue when it was sold to Stuart Bamforth, one wonders how the future of that club would have evolved if the deal had gone through. His influence on speedway extended beyond his riding career, acting as a mentor to Kenny Carter and Hans Nielsen. The DVD includes footage of both riders in action, including clips from the famous 1982 World Final when Carter and Penhall clashed. Mauger is able to share a few secrets from the pits at that meeting and believes that Carter would have won if he'd not been influenced by others. There are a number of books about Ivan, but these don't offer the chance to see this great rider in action once more. This DVD (lasting four hours) would be a welcome addition to any stocking this Xmas.